So 1000 posts and thread locked, time to start another. I haven't been playing as much mostly because lack of orbs. I have been playing every day, though, for the free stuff. I also keep forgetting to check in every 30 minutes for the voting gauntlet. I'm out of brave axes. Spare ones, anyway. And that means I can't build michalis OR cherche. Atm the game is starting to remind me of pre-piis pad. I don't know if there was ever an era that didn't have tamadras, but throw that in there too. And take out farmable skill ups (limited to two! ^^) and you have the current fe heroes. Oh would you like to get some fancy new upgrades in weapons and skills for your unit-in-work? Well pay up them stones. Oh wait, I forgot. Take out the extra dungeons too, no stones for you. Oh right, and limit evo-mats to being acquirable only once a month and only if you evolve NOTHING ELSE in the meantime. e: if they're going to continue making feathers so abominably difficult to acquire in large amounts at once, the least they could do is at least offer an option to pay for some 5* skills in feathers for some discount amount at inheritance. I wouldn't mind shelling out 5k feathers for per 5* skill, or hell even 10k for a 5* skill. This probably sounds like an excuse, and maybe it is, but we've seen things improve a lot since the start and I imagine they'll continue to do so. Just like with PAD. If you're at a point where you're not having fun, maybe take a break and keep an eye out. Or only login once daily to do PVP. No sense pushing it if it's moving too slow for you. No yeah for sure. Bored at times, sure, but I'm still having my decent share of fun. Trying to come up with new builds is always fun. More of a short laugh of exasperation. All I want to do is continue building with blocks and there's no more blocks for an unforeseeable while is all. Can't say the same for others. To any lyn users: how is galeforce post skill-inheritance? I happened to use a cordelia with one and was confused for a second when I had an extra action before oh oh oh started. Seems pretty good. Gale Force is really hard to evaluate. It's occasionally a lifesaver, but it takes a lot of setup to use, sometimes it doesn't really do anything, and it takes up a slot that might be better suited for Moonbow or something. But Lyn tends to hit like a truck if she's at critical health, so in many cases she doesn't actually need another ability in its place to take things down. Notably it pairs really well with Rehabilitate since most enemies should be able to knock Lyn low but not quite kill her as long as you keep lance users and brave weapons away from her, which lets you get the benefit of her low-health abilities while also surviving long enough to do stuff. I've gravitated away from using Lyn in favor of Olivia, but there's no doubt that with some proper setup Lyn can sweep through whole teams solo. Building around her with a Rehabilitate healer and several Wings Of Mercy users might be really interesting. If I was going to do that would I replace Gale Force? Probably not, but that might be more for flavor than for any other reason. I feel like Galeforce is better on a tanky unit, or someone that can kill stuff at range. It's much easier to get away with ranged killing than attacking 2rng up close. If you can tank, you just rack up the counter on an applicable target and go to town. Lyn is neither of these. In an attempt to better increase my tactics, I decided to try analyzing how the ai decides to make its moves. I took screenshots of every turn of every battle since then, deliberately remaining passive to see how the ai moves and using up a couple duel crests in the process. At first it seemed easy, the ai initially 'assigns' a target for each unit and moves each unit independently to head towards the opposing unit that it could deal the most damage to. But the real wtf quotient starts kicking in when the ai starts attacking you. The more I played, the less sense the underlying decision making process made. An ai marth would attack subaki instead of palla. Sometimes it would ignore a kill to do even less damage (and I'm not talking complex move patterns here). Sometimes it would ignore damage and color advantage (that could have orko'd) to instead attack an off-color unit. Sometimes it chooses to attack the color disadvantaged, bulkier unit instead of the frailer, color neutral one. I don't get it. I can only assume that there's an rng that sometimes causes the ai to make less than optimal decisions. Which I guess can be neat at times when you survive for no intelligible reason, but it makes things conversely hard to predict. Since the first 3-4 turns are what mostly determine the match, even though the first tidbit I guess is all I would need to know and be reassured of its apparentness, it is still a little bamboozling. e: ah, I just realized, this means that it's very difficult to nearly impossible to separate two identical or nearly identical threats from each other (say, two takumis) from clumping together. You would really have to abuse the secant out of the terrain and initial unit starting positions. If the two takumis or whatever start next to each other, good luck I guess. But then again, y'all run stuff that aren't afraid of him anyway. The best way would be to bait one of them into attacking another unit while staying out of the second ones way. Then while you kite the first one away, the second will continue to go after its initial target (I think... as long as you stay out of its way). That seems strange. Usually the AI in every FE game can be predicted down to the digit. Having it randomly attack targets just seems very off from what they're known to do in the games. Forgive me for the double post, but I'll give the practical application of it here. Since the ai will initially assign a target for each of its units to go after, ideally you will want to bait the enemy into sending a pair or so of units towards your pair or so of units that can effectively deal with the threats while keeping the bait out of reach. Eg: the enemy has 2 red sword units and 2 mage units. You send the magically frailest unit off to bait away the mages while your second group contains, say, a blue lance unit and a physically frail the physically frailest green unit to bait the red sword units towards you. Swiftly clean up the reds and go the care of the remaining mages. Ideally you'd have something like that, but it may not always be so perfectly possible what with the map (bridges, anyone?) or having your bait trap unit invite its own threat too because of its weakness. This will be all the more abusable once pre-battle positioning becomes a thing. e: managed to get a no death full run of arena with all fliers (yayy for palla in the bonus characters) with this newfound knowledge. Couldn't even break past the 50k rank though. I should probably form an arena scoring team sometime too. She's +Res, - Spd, which is frankly pretty awful. Could have kept her for redundancy, to try a different set, to inherit Brave Axe+ onto something, or for some kind of insane four-Camillas team, but I decided to merge her with Camilla Prime for +1 HP and +1 Spd. Camilla would be sad if she didn't have a Corrin to love. I think the dream team right now is 2x Camilla, FCorrin, and MCorrin. The only one I don't own is the MCorrin. So after over 170 recorded PVP matches I FINALLY found an enemy team with a duplicate unit on it. You'll never guess who it was. I revise my previous statement. It's a bit erroneous to say that the ai 'assigns' a target at the start of the match. I was so confused by its moves in the later half of the game that I was stuck in a weird state of mind. It would probably be more correct to say that the ai always moves any unit not in attacking range towards the unit that it would do the most damage to. There seem to be some exceptions, such as when the unit would do 0 damage anyway, or if the unit has a rally command of some sort. I also made another small discovery to add to this. When the ai is choosing which of your units to move each of their units towards -- I've already mentioned that it appears to move towards the unit it would do the most damage to, ie: it performs simple cross-damage calculations against each of your units and simply picks the one that would provide the highest damage -- but the ai also seems to ignore any non-permanent buffs when performing this calculation. To provide an example, consider the following. 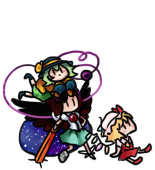 You have two flying units: flying unit X with 18 natural defense is in the left corner of the map and another flying unit Y with 17 natural defense is in the right corner of the map (assume that all units have equal speed, ie: no doubling). 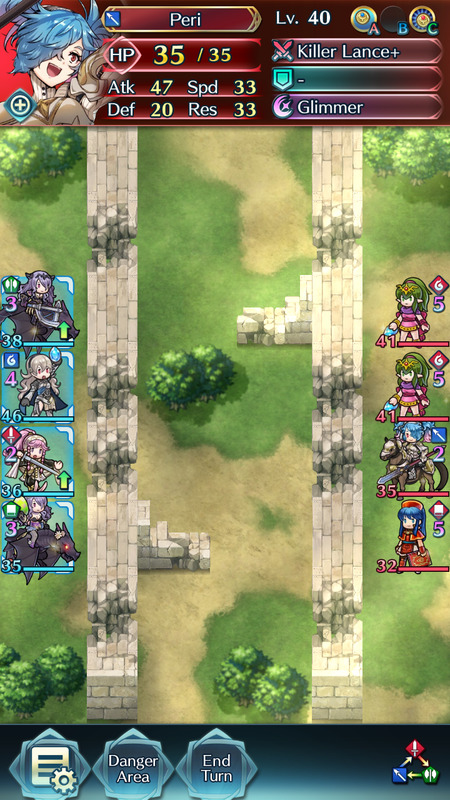 The ai will move its bow units towards the unit in the right corner, EVEN IF that unit is currently receiving defensive buffs (regardless of whether it's from a hone or goad skill) that is making its current defense higher than that of the unit in the other corner. B will move towards the one with naturally lower defense, even if it is currently higher through buffs, whether from in-combat (spurs) or displayed (fortify) buff skills. Since direct stat mods like Def+3 skills are permanent, these are not ignored. This is pretty huge, since it means that you can safely buff your units without having to worry about how it will affect the ai's movements. Thinking of putting Goad Fliers on SCamilla. She's still got nothing in her C slot. I wish my Palla wasn't -ATK, or I'd probably just kick her to 5* instead. All of her default skills are great except her sword, and her stat spread is pretty solid. That's probably not a bad call. I run Threaten Speed on mine and it is nice, but mine is +Spd or I probably would have picked something else. What are you running on her as an active skill? Mine still has Rally Attack and it does come in handy occasionally, but mostly I keep finding myself wishing it was Swap or Reposition. Not that I have an extra Reposition on hand. 5-hour maintenance scheduled for tomorrow, I think this is the first maintenance? I hope it gets extended for free orb compensation. I get enough use out of Rally Attack to keep it there, but I've considered swapping in Reposition, which is just completely bonkers on fliers. I already use it on Hinoka to great effect - it's a great get out of jail free card for Reinhardt or Takumi following a ranged snipe. Only the legendary 24-hour maintenance can save us all. I have too many dagons. Huh do sword refreshes and arena quests refresh happen at different times? No, there just seem to be no Arena Quests/Free Orbs today. I'm really at a lost as to what B-passive to give Palla. Took the opportunity to make her 5* since she's one of my goad mvps. Currently running fury 3 too, might even consider changing that. Nothing is really good there that I can think of. Any suggestions anyone? The default answers seem to be Escape Route, Wings Of Mercy, and Quick Riposte. You could also look into various weapon breakers if there's one that secures you a significant kill or protects you from one. Decided to get that last WoM because why not. Can't think of any hard counter color units. And also went ahead and gave her ruby sword+ since I had nothing else in mind and now Hector does no damage while she can otko him without any buffs. Feels good. Wait I just realized and wanted to know do we have to wait for our voting prizes too after the maintenance?